While we will spend a lot of time with this blog mentioning the things we try to do for others, we also will give a shout out to the wonderful people in our lives and the things they go out of their way to do in order to make us feel special. One of those people is a friend of our’s whom I first met playing soccer with in college. We invited her to our wedding back in May and at first were sad when she informed us that she would be unable to make it. What we didn’t know was why. She signed up for the 2-day Avon Breast Cancer walk taking place near where she lived months prior, which just happened to fall on the same weekend as our wedding. Just in itself, her devoting time and effort to fund raise and walk for Avon is a selfless feat, but she also wanted us to know she would be walking in memory of my mother, a woman she never met. For those two days, our friend sported a bright pink tutu with her team and walked 39 miles proudly with not only my mother’s name on her back but also the names of 11 other women. Later in the summer she sent us a great note about her experience along with pictures of her and her team. We keep them hung up in our office as a reminder of her selfless pink adventure. It can be easy to feel sad when close people to you miss important events in your life such as a wedding, but we feel ecstatic knowing there are so many people willing to devote themselves to causes bigger than them. We look forward to hearing about her experience in this year’s walk! Interested in learning more about Avon’s Breast Cancer walks? Since 2003 they’ve raised over $440 billion to put back into research along with prevention campaigns and care programs to the medically under served. Now that’s a good reason to tie up those laces and hit the pavement! 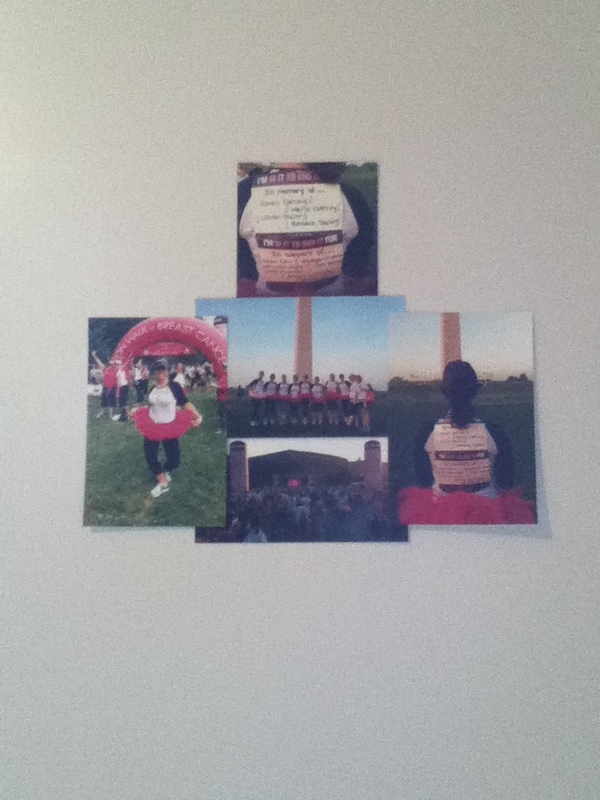 Her picture collage on our wall! This entry was posted in Uncategorized and tagged Avon Breast Cancer Walk, Washington DC on February 17, 2013 by caffreem.